Yammer has been quite a success at my workplace. Not off the charts like at Deloitte, yet very much alive and growing. It warms my heart to see my colleagues asking and answering questions, sharing web articles, crowdsourcing ideas, gathering feedback, praising team mates, comparing notes on where to buy the best coffee, and even whining a little. Every so often I’m asked by a peer at another company what they can do to increase the use of Yammer in their own organisation. I’m happy to share my opinion with them (borne from my experience), but thus far I have been cognisant of the fact that I haven’t cross-checked my ideas against those of others in the corporate sector. So I recently invited 14 community managers from around the world to rate the key factors that drive Yammer use in their respective organisations. The results are summarised in the following graph. While my sample size is probably too small to infer any significant differences among the factors, observation reveals a tiered arrangement. The front runner is business champions. These enthusiastic users encourage the use of Yammer with their colleagues across the business. The importance of this factor is unsurprising, given the effectiveness of WOM in the marketing industry. Employees presumably trust their team mates more than they do HR, IT, or whoever “owns” Yammer in the workplace. The next one down is another no brainer: internal promotion. Typical promotional activities such as newsletters, testimonials and merchandise not only raise awareness among the users, but also act as ongoing reminders. If WOM is the steam train, promotion is the coal that keeps it chugging. Intrinsic motivation is obvious to anyone who knows the saying “You can lead a horse to water, but you can’t make it drink”. In other words, you can unleash your business champions and push all the promotion you like, but if the individuals who comprise your target audience lack a collaborative attitude, they won’t use Yammer. Rounding out the top tier is top-down support and participation. Not only is it important for the user’s direct manager to be enthusiastic about Yammer and participate in it him- or herself, but it’s also important for the CEO, CFO, COO, CMO etc to do the same. They must lead by example. At the next tier down, informal support resources have some importance. I guess self-paced tutorials, user guides, tip sheets etc are less of an imperative when the system is so damn easy to use. Not to mention that just about everyone knows how to use Facebook or Twitter already, so in that sense they have prior knowledge. User acknowledgement is also somewhat important. Everyone wants their questions to be answered, and perhaps attract a “like” or two. Otherwise, why would they bother? 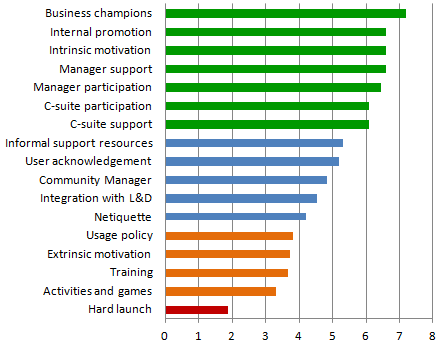 The placement of Community Manager at this tier pleasantly surprised me, given the pool of respondents. Nonetheless, some sort of management of the forum is considered important in driving its use. Integration of Yammer-based discourse into L&D offerings was also placed surprisingly low. I suspect that’s because only intrinsically motivated learners participate in it anyway. Rounding out this tier, it appears a decent sense of netiquette is the norm in the workplace. You would be a clown to behave otherwise! At the lower tiers, we see the factors that are considered less important by the respondents. I guess a formal usage policy is irrelevant to intrinsically motivated users, while prizes, points and other forms of extrinsic motivation are similarly redundant. Same goes for activities and games such as “fun facts” and trivia quizzes. And one thing’s for sure: a traditional project management approach characterised by a hard launch and follow-up training misses the mark. In summary, then, we see that enterprise social networking is multifaceted. There is no silver bullet. If your objective is to drive the use of Yammer in your organisation, you would be wise to focus your energy on the factors that offer the greatest return. In the meantime, bear in mind that social forums grow organically. It takes time for individuals to see what’s in it for them and jump aboard. Having said that, if the culture of your organisation is bad, it either needs to change or you should shift your efforts to something else. This entry was posted on 18 June 2012 at 12:10 and is filed under enterprise 2.0, social networking. You can subscribe via RSS 2.0 feed to this post's comments. Thanks for this post. It’s interesting to note that success of Yammer is due to business championing and not an integration with L&D initiatives (although I believe, based on my experience, that not all L&D practitioners and managers use – or know how to use – this in their programs anyway). I believe the challenge for me now is how to inspire its use in a department that has been through so much change and flux – and where trust is an issue but having a business champion and internal promotion that you mentioned would be the way to go. Thanks for the suggestions and a place to start. I think you’re absolutely right: there’s more scope to the L&D piece. It reminds me of “flipped classrooms” – while fashionable, they can be done badly! Hi Ryan, posting a link to this on our Yammer site now ;) , even though ours is currently just for ‘BTW’ conversations – it’s puttering along on intrinsic motivation. Congrats on making Jane’s E-Learning Picks of the Day! Was Jane’s E-Learning Pick of the Day for Informal first? I was quite chuffed by that, I must say. Great post Ryan – very informative and useful to consider as I am contemplating launching yammer in my organisation. My main aim is to use it as a vehicle to promote social and informal learning. That’s probably not the way I should promote it though! Promotion should always focus on the WIIFM (just in case you were after another acronym). I recommend highlighting the ability to ask a question when you don’t know where else to turn; asking for feedback about an idea; sourcing new ideas; celebrating wins; publicy thanking someone for a job well done; or simply making the broader organisation aware of something. You might also consider the email reduction angle. But that depends on how your organisation feels about email and how they use (or abuse) it. Please let me know how it goes…!